Located near the 1936 Texas Centennial project where the CCC helped construct a replica of the Parker stockade from which Cynthia Ann Parker was kidnapped during a Comanche raid in May 1836, Fort Parker State Park was built by the enrollees of CCC Company 3807. They followed the designs of numerous planners, architects, and landscape architects working for National Park Service and the State Parks Board. Among them were George T. Patrick, Ben R. Chambers, Jay T. Dunlap, I. Gelber, and Donald D. Obert. 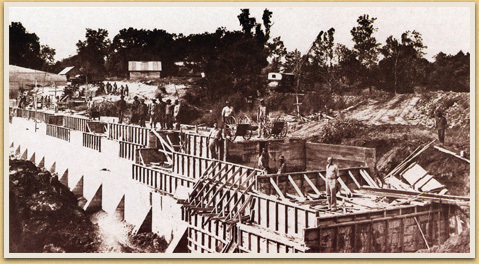 The men in Company 3807, black sons of area sharecroppers, also laid down one of the most striking and ambitious of all CCC projects: an impressive 423-foot limestone and concrete dam across Navasota River, impounding 750-acre Lake Springfield. The rigorous work involved blasting, breaking and hauling rock for cement, digging out the dam footings, spillway, and wing walls, and pouring cement. Most of the work was done by hand, digging with pickaxes and shovels and hauling rocks and cement in “Georgia buggies,” deep wheelbarrows with two wheels. The CCC Camp Mexia had its own sawmill and limestone quarry, at which the men prepared the timber and secured the rock used in the buildings, structures, and features. Ironically, the park's service area was established on the site of the ruins of Springfield, a mid 19th-century African American community, and after completion of the work at Fort Parker State Park, African Americans were barred from visiting the park, a statewide policy that remained in place until the 1960s. Entrance Portals, Park Road 28, Curbs and Culverts, CCC Camp Infirmary (currently the park headquarters), Caretaker’s Dwelling, Combination Building, Lake Dam and Concrete Spillway, Picnic Table and Bench Combinations, Water Fountains, and Bath House (currently the open pavilion). A group of cabins was proposed and designed by the Works Projects Administration but not built during this period.